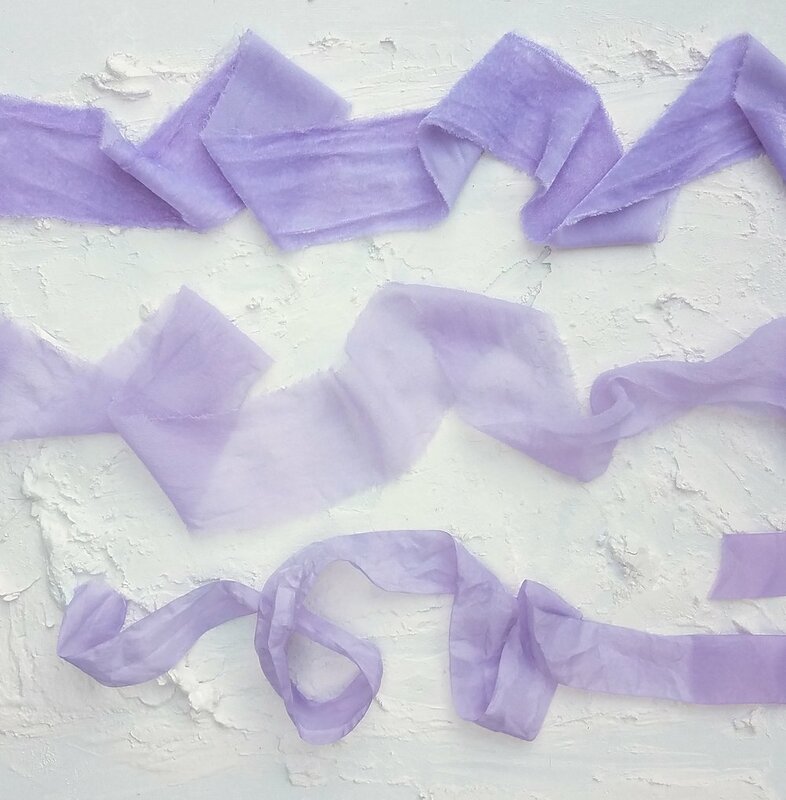 I absolutely love the look of the hand-dyed silk ribbons out there. They add such a hand-done touch to the garden design look I do in business and which most of my brides love. They can add so much atmosphere to the photos and really elevate the bouquets. However, being new to the floral industry, the big budget brides that can afford the luxury of the small details do not yet have me on their radar. Most of my brides have more modest budgets, and I’m proud to say my specialty has become working with budget brides to give them beautiful and custom flowers. However, when these ribbons can be upwards of $30 or $40 for one bouquet with streamers, there often isn’t room in the budget for the hand-dyed silk ribbons that dominate their Pinterest feeds. Luckily, one of my hobbies back in my youth was quilting. How does that relate? Well, to save time and effort, we could rip the higher quality quilting cotton into strips any width to sew them. They had unfinished edges, but that didn’t matter once we stitched them together. I realized that the rough edge look in silk ribbon is just ripping the fabric! So off I went to rip and dye my own ribbon fabric. And before you tell me, “Madelaine, I just don’t have the time,” I did ALL of this during the commercial breaks while watching our beloved Pittsburgh Steelers on Sunday, with one hand devoted to capturing the photos. So please don’t feel like this is an impossible and time-consuming task. It seems like a fun one for all the side-hustle flower moms out there to do with their older kids too! Step 1: Order your fabrics. I love the look of the silk velvets and the chiffons out there. For this test, I did a quick internet search to find where I could buy yardage of silk velvet and chiffon. Since I wasn’t exactly sure this would work, I just found fabric for about $10 a yard. Good news: it worked! However, if you were making a large amount of ribbon, I would suggest buying a higher quality to make the process easier and have less fraying to combat in the end. I also had some May Arts white silk ribbon I used as a higher quality fabric ribbon for control. Step 2: Rip your fabric. My favorite look is the nice wide ribbons, so I chose to do 2.5" ribbon stripes. I measured 2.5" then made a small incision at the edge of the fabric. Then, I took the fabric in both hands, on either side of the small incision, and gave a forceful rip. As long as the material is of reasonable quality, it will rip along the cut you made in a straight line. I did this until I had a complete strip of ribbon. I had to pull parts of the ribbon straight and take off stray thread fly-aways because I wasn’t working with a high-quality fabric for this test. Step 3: Prep your dye. I looked up some common household grocery items that could be used to dye fabrics and what color they would come out to be. I chose red cabbage because it is supposed to give a blue dye, but can easily change color as you manipulate the pH with vinegar or baking soda. I followed online instructions I found that related specifically to dying with red cabbage. I thinly sliced the cabbage and put it in a pot to just covered with water. You could already see the pigment coming out from the cabbage after a few seconds! I then boiled the cabbage for about an hour to get as much color out the cabbage as possible. 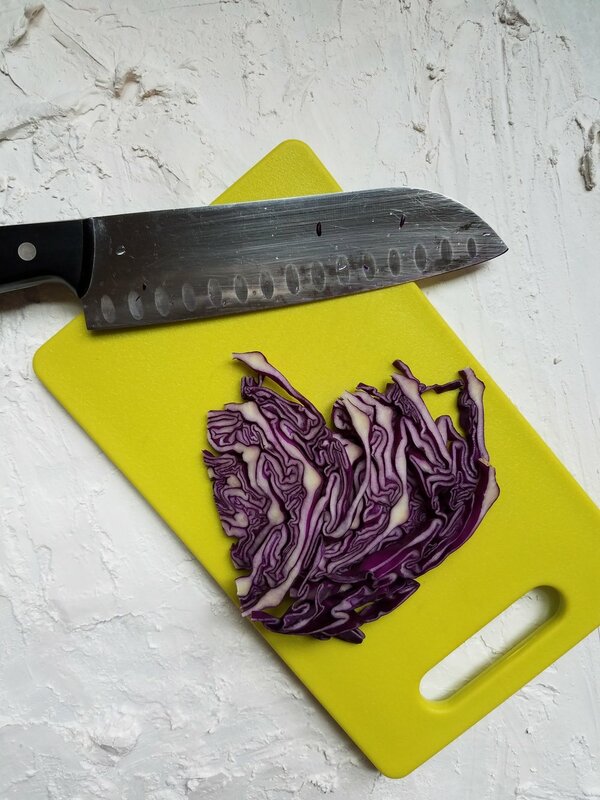 Once the boiling was complete, I strained out the cabbage to have a clean dye. Step 4: Dye the ribbon. 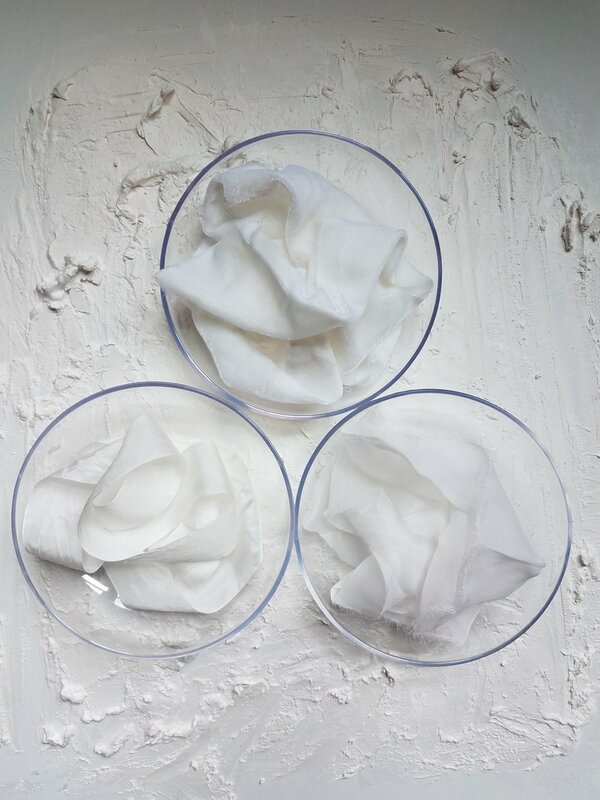 Below is the velvet, chiffon, and plain silk ribbon before dying. I submerged my ribbon into the dye while it was still very hot. It took the color instantly. For good measure though, I let the ribbon sit in the hot dye over low heat for 30 minutes to get as much color as possible. As it simmered, I prepared an ice bath for the ribbon once it came out of the dye. Once the time was up, I took the ribbon out of the hot dye and immediately dunked it into the ice bath. I pressed as much liquid out of the ribbon as possible and gave it a quick rinse of clean water. You can see below the velvet, chiffon, and plain silk ribbons after dying. Step 5: Let the ribbon dry, then press. I hung my ribbon on the shower curtain rod to dry. The chiffon and plain silk dried in a few hours but the velvet needed overnight drying. To reduce wrinkling, I opened and flattened the wet ribbon while hanging. If you flatten the ribbon before drying, you get a lovely wrinkled version for a boho and casual look. But if you want fewer wrinkles, you can simply run the piece of the ribbon through a flat iron you’d use on your hair once the fabric is dry. In the photo below, the left side is wrinkled and the right side I ran through the straightener. I hope you enjoyed learning how easy, satisfying, and cost efficient this project can be! Go forth and give your bouquets that wonderful air of hand-done and effortless design. There are a few caveats to this process that I need to mention before you get started on your own ribbons. Many of the hand-dyed silks out there are natural and plant-based dyes. This requires extensive knowledge of each dye, and how they interact with the specific material the fabric is made from. It is also imperative to know the best type of mordant (or substance that fixes the dye to the fabric) that works best with each type of natural coloring. If you do not do this properly with natural dyes, the color will wash out almost immediately. 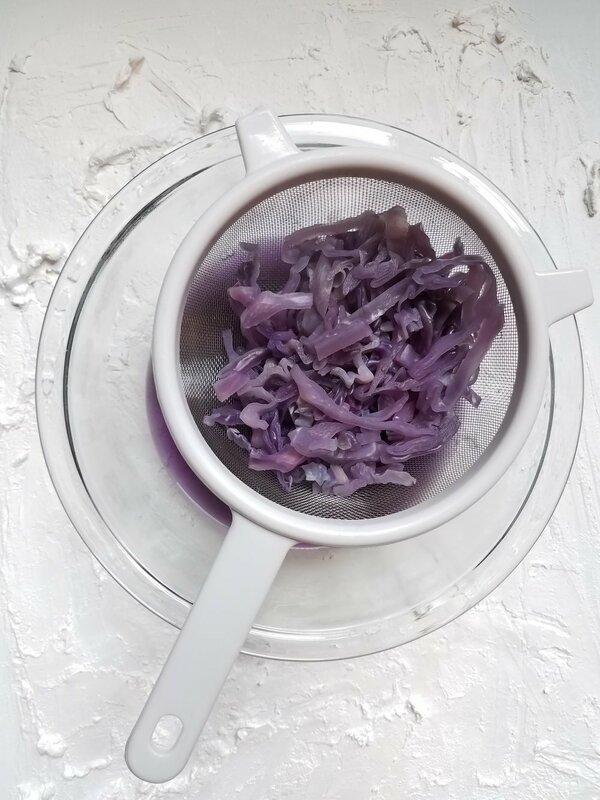 I got lucky that the pot I used for boiling the cabbage and fabric was a type of inorganic oxide that acted as a successful mordant and allowed the ribbon to hold the color, although it changed the blue dye color to a strong lavender. The florist half of a mother-daughter planning and floral business serving Western NC and North GA. Inspired by my upbringing in the lush forests of the Smokey Mountains, and finding balance in growing my floral business while holding a full-time career as a chemistry analyst. Team Flower Member since February 2018.